Since getting our grill, we've been grilling every single night. To say that we are putting it to good use is an understatement! We've grilled the typical things like burgers and sausage, but we've also roasted vegetables and made a pizza. I can't wait to share all of grilled goodness with you throughout this summer. One of the delicious grilled meals that we have enjoyed is this chicken dish. 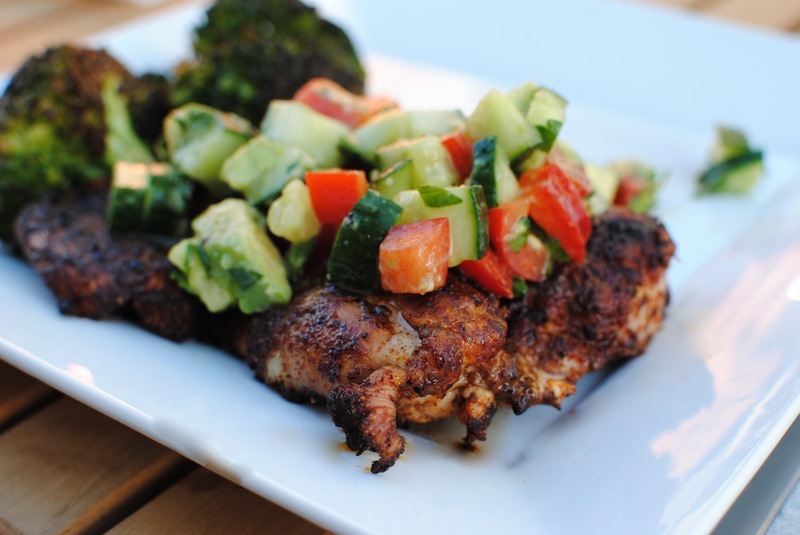 Chicken thighs are a bit newer to me than chicken breasts, and they are so much more flavorful. I don't know what took me so long to get on that train! Being that chicken is a blank canvas, it offers many opportunities to spice it up as you wish. This particular spice mix gives the chicken the perefct amount of kick, and this particular salsa helps to cool down said kick! These flavors offer the perfect balance. Bonus, this meal can be prepared so quickly that it is the perfect weeknight meal! In a bowl, whisk together the lime juice and honey. Add the remaining ingredients and toss to coat, adding salt and pepper as needed. Set aside. In a small bowl, mix together the chile powder, cumin, cayenne, lime zest, salt, and pepper. Rub the mixture over both sides of each of the chicken thighs. Grill the chicken for about 4-5 minutes per side, or until cooked through. Alternatively, you can cook the chicken in a skillet on the stove or broil it in the oven. Spoon the salsa over the top of the chicken before serving. *As noted by Elly: Ancho chile powder is made from ground ancho chiles. If you use a commercial chili powder, as I did, note that it includes cumin. Therefore, you may want to cut back on the cumin and increase the cayenne a little bit. I used the following measurements: 1 tablespoon Chili Powder, 1 teaspoon Cumin, and 1/2 teaspoon Cayenne. Line the bottom of a 9-inch round springform pan with parchment paper and grease the sides of hte pan with butter or cooking spray. In a large bowl, mix together the flour, baking powder, and salt. In the bowl of a stand mixer, combine the butter, yogurt, and sugar and mix on medium-high speed until light and fluffy, no more than 2 minutes. Reduce the speed to medium and mix in the egg, beating until light and fluffy. Then add the milk and vanilla. Reduce the speed to low and gradually add the flour mixture, mixing just until incorporated. Fold in the chocolate chips. Pour the batter into the prepared pan. Arrange the strawberries on top of the cake, cut sides down and close together. Sprinkle additional chocolate chips between the berries. Bake at 350 degrees for about 1 hour, or until the top of the cake is golden brown and a toothpick inserted into the center comes out clean. Remove the cake from the oven and cool for about 40 minutes before releasing it from the pan. Dust the top with powdered sugar, if you want to make it look fancy! It's finally summer! Once again, with the end of the month comes another installment of Secret Recipe Club reveal day! This month, I was assigned to Natural Noshing, a blog written by Nora. Nora lives in Montana with her hubby and dog. Back in 2012, they opened a frozen yogurt store, and I think that is the coolest thing ever! Nora eats gluten free, and has cut back on her refined sugar, so her recipes are all relatively healthy! Of course, there are a few guilty pleasures, like Ice Cream Cake Ball Bombes and Peanut Butter Bliss Ice Cream, which were two of my top contenders. But, I've been doing Beachbody's 21 Day Fix, and unforthunately neither of those two recipes fit into my meal plans, so I decided to make these beet chips! I'm not a huge potato chp fan, but if they are in front of me, I will munch on them until the bowl is empty, so if I'm going to snack, I may as well snack on something healthy, that also counts as a serving of vegetables! While these beet chips took a little longer than expected, the end result was delicious! A snack that you don't have to feel guilty about eating. Just as healthy as kale chips, but prettier! Just do yourelf a favor, don't overlap them on the baking sheet or they willl never cook! That may have something to do with the cook time issue I had! If you are looking for an earthy and healthy snack, look no further than these chips! Thanks for the recipe, Nora! I had a great time getting to know you this month! Using a mandoline slicer, thinly slice the peeled beet. Toss the beet slices in olive oil and spread them in a single layer onto a baking sheet that has been lined with parchment paper. Sprinkle with sea salt and bake at 325 for 20-30 minutes, or until crispy. Cool slightly and serve. Mornings can be hectic, and the last thing I have time for is preparing a meal. I like the concept of grab-and-go. That is why muffins make for an easy breakfast. Although, sometimes eating a muffin is basically like eating a cupcake...sweet and not so good for you. Not that I'm complaining, because I love a good chocolate chip muffin from time to time, but I would prefer to start the day on a slightly healthier note. These muffins do just that. They are chock-full of healthy fruit and seeds that give you the energy you need to power through your day, or at least until lunch time! In a large bowl, mix together the flour, sugar, cinnamon, baking powder, and salt. Stir in the raisins, apricots, carrots, and apple and mix to combine. In a separate bowl, whisk the eggs and add the crushed pineapple, oil, and vanilla. Add the wet ingredients to the dry ingredients and stir until just combined. Stir in the sunflower seeds, pepitas, and chia seeds. Line a muffin tin with liners and fill the wells until heaping with mixtrue. You should be able to get about 14-16 muffins. Bake at 350 degrees for 34-38 minutes, or until the tops of the muffins are golden brown. I've been holding out on you. This recipe is leftover in my files from Easter. I can't believe I haven't gotten around to posting it until now. If you like Mounds bars, you'll love these bites. Not only are they easy to make, but they are a huge hit with a crowd! I ate a few more than I'd like to admit, but there were plenty to go around for all of my guests. Next time, I might add an almond to the center of these to mimic that of an Almond Joy bar. That would be delicious! Mix the coconut and condensed milk in a large bowl until a sticky paste is formed. Roll the mixture into 1-inch balls (you should be able to make about 36) and place them on a parchment paper lined baking sheet. Freeze for 30 minutes. Meanwhile, melth the chocolate. You can either do this in a heatproof bowl over a pot of gently simmering water, or in the microwave in 30-second intervals, stirring between each. Using 2 forks, dip the coconut balls into the melted chocolate, rolling to cover evenly. Place them back on the parchment lined baking sheet and top with a pinch of sea salt, if desired. Repeat with the rest of the coconut balls. Allow the chocolate to set, either at room temperature or in the fridge. Store in an airtight container in the fridge. Wow, has it really been a month since my last post? I apologize! It's been a busier month than expected. School is almost out and the track season is just about over, so I'll have more time to cook when it is still light enough to get some decent pictures. It's Secret Recipe Club Reveal Day! This month, I was assigned to Chocolate & Chillies, written by my neighbor to the north Asiya. Asiya lives in Toronto, which is a favorite city of ours, and is only about 2 hours away from our house. Asiya is a stay at home mom to 2 boys. Her family is from India and her husband is Pakistani, so she has some amazing recipes to choose from, including Chicken Biryani, Falooda, and Muhammara Pasta just to name a few. As you can imagine, it was pretty difficult to choose just one. But, as soon as I saw Asiya's recipe for tapioca, I was sold! When it comes to dessert, pudding is usually pretty low on my list of preferences. Generally, I'll pass if given the option. However, tapioca pudding has always been a favorite of mine. While we didn't eat dessert often growing up, there was always a box of instant tapioca pudding in the cabinet ready to be made whenever the craving hit. Since I have grown up and moved out, I don't have that constant box of tapioca in the pantry, although after trying this recipe, I very well might! The coconut milk gave the pudding such a delicously rich flavor, and the flecks of vanilla bean were so pretty. The mango puree gave the pudding just the right amount of sweetness. Thank you for the delicious dessert recipe, Asiya!! I had a great time getting to know you this month! Pour the milk and coconut milk into a medium saucepan and add the tapioca pearls. Soak for about 30 minutes. Whisk in the egg yolk, sugar, salt, and vanilla and place the saucepan over medium heat until the mixture comes to a simmer. Reduce the heat to low and cook until thickened, stirring often. Pour the mixture into pudding cups and chill in the fridge overnight. Place the mango and sugar in a food processor and process until smooth. Store in the fridge. To assemble, spoon some of the puree over the top of the pudding. Enjoy! Today is Secret Recipe Club reveal day! SRC is such a great way to get to know bloggers from all over the world. Case in point, this month, I was assigned to Shirley’s blog, Enriching Your Kid. Shirley blogs from India! Even though she is half a world away form me geographically, it is so cool to be able to click a button and get to know her as if she was right next door! Shirley is a clinical psychologist turned stay at home mom of two children. I felt an instant connection when I saw that her son and my husband share a name! Shirley’s blog is filled with amazing dishes that have been passed down to her from her mom, as well as her own creations. There were several recipes that I was immediately drawn to, such as beetroot paratha, homemade paneer, and paneer burji, and I definitely will be revisiting those recipes soon to give them a try. While all of those were savory recipes, I had a hankering for something sweet this month, so I ultimately made this pineapple jam. A simple recipe of 3 ingredients makes for such a versatile jam that can be used in many ways. To me, it seemed to have the consistency of applesauce, and while I suppose you can eat it as is or use it on a sandwich as you would any other jam, I found that it makes a delicious topping for an ice cream sundae! I also stirred a bit into my morning oatmeal, along with sliced banana and mango. It was as delicious as it was easy! Shirley, thanks for such a delightful recipe! I look forward to giving many others a try, too! Chop the pineapple into small pieces and place them in a saucepan. Add the sugar and cook over medium heat for about 10 minutes, stirring often. Cool the mixture and pour into a blender. Puree the mixture, then pour it back into the saucepan and place back over medium heat. Cook, stirring often, until it reaches the consistency of applesauce, about 10-15 minutes. Add the cardamom and remove from the heat. Allow the jam to cool before placing it in a covered container and putting it in the fridge. With the warm weather finally arriving, I’ve been thinking a lot about sprucing up my backyard and garden. I started my vegetables from seed again this year, but learned from my mistake last year of overcrowding things in a tiny little space, and therefore planted much fewer. Hopefully this year, we will actually be able to grow our own produce. Just thinking about it is making me crave light and healthy meals, made up of mostly vegetables. However, you can only add so many spices to vegetables as you roast (or grill) them before they start to become boring. So, I’m always on the hunt for ways to bring more flavor to my roasted vegetables. Enter this sauce. This recipe was very easy to make and absolutely delicious. It reminded me of a pesto, except red. If my garden has any success this year, I could potentially end up with a lot of red peppers, so it’s always nice to have a recipe to make that will use some of them up. We tossed this sauce with roasted vegetables and served over some fresh ravioli, but it would be just as delicious as a topping for chicken or fish, or even just for topping crostini. Place all ingredients except for the oil into the bowl of a food processor. Process until blended, then slowly add the oil through the top until the sauce has reached the desired thickness. Season with salt and pepper, to taste. Serving suggestions: toss with pasta, vegetables, poultry, seafood, or crostini. Line an 8x8 baking dish with parchment paper overlapping in a crisscrossing pattern, leaving some overhang for easy lifting. In a bowl, mix the melted butter with the crumbs until moist. Pour the crumbs into the prepared dish and press until evenly distributed throughout the bottom of the dish. Bake at 350 degrees for about 10 minutes while preparing the filling. In a food processor, puree the raspberries until smooth. Press the pureed berries through a fine mesh sieve, pressing out as much juice as possible. Discard the solids/seeds. Add the sugar to the puree and stir to combine. Set aside. In a large bowl, beat together the cream cheese and sugar until smooth. Add the lemon juice, zest, milk, eggs, and vanilla and beat until smooth and creamy. Pour the mixture over crust and spread with a spatula to even it out. Spoon the raspberry mixture over the top of the mixture and swirl using the tip of a knife. Bake at 350 degrees for 30 minutes, or until the cheesecake is set around the edges and jiggles slightly in the center. Cool completely then refrigerate until ready to serve. We’ve been in a funk lately. Neither cooking, nor eating, has given us any joy. Perhaps it’s the winter we’ve been experiencing. Now that March is here, things aren’t much better. It is my least favorite month. It just seems so long, especially when temperatures are still frigid, snow is piled high, and spring is nowhere to be found. To spice things up a bit, and perhaps to bring some happiness back to our meals, I’ve decided to challenge myself to go meatless for the whole month. We’ve done it before, but we’ve taken break over the past few years, so why not bring it back? I sat down at my computer and planned out meals for the entire month of March so as to go into the challenge prepared. I have to say, the whole first week was a success. It has been a while since I have liked every single thing that has come out of my kitchen, but this week surprised me in the best way possible. 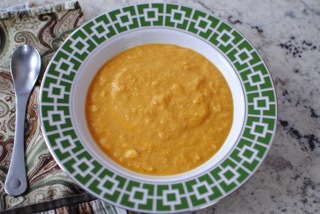 This soup was one of the recipes we made this week. Besides the fact that it was incredibly easy to prepare, I had seconds and Joel had thirds(!) which is basically unheard of around here! To say we enjoyed it is an understatement! Here’s hoping that the next few weeks come with just as much success in the kitchen, and in the challenge, as this one. In a large pot over medium heat, melt the butter, then add the onion and cook until softened, stirring occasionally, about 8 minutes. Add the cauliflower and cook until it begins to brown, about 10 minutes. Add the broth and water, increase the heat to high and bring to a boil. Once boiling, reduce the heat and simmer until the cauliflower is tender, about 20 minutes. Puree the soup with an immersion blender (or in batches in the blender).Add the cheese and stir until melted. Season with salt, pepper, and cayenne. While we have gotten away from the weekly waffles we once enjoyed on the weekends, they are still a welcomed treat every so often. Since yesterday was valentines day, I had hoped to make a special breakfast, but when I woke up, the weather wasn’t exactly cooperating enough to allow me to make a quick run to the store. Luckily, we had everything we needed to make some waffles! I tried a different recipe from the ones I have already posted, and I couldn’t have been happier with the result. While most waffles we have had have either been very dense or so light and airy that they are crispy, these waffles had a great consistency. Substantial enough that we were full after eating one, but not so filling that we were feeling bogged down all day. The leftovers reheated nicely for a Sunday morning breakfast, as well, which certainly helped to combat the -25 degree temperature outside (I only wish that was an exaggeration)! In a large bowl, whisk together the flour, sugar, baking powder, and salt. In another bowl, whisk together the milk, eggs, and oil. Pour the wet ingredients into the bowl with the dry ingredients and whisk well to combine. Gently fold in the blueberries. 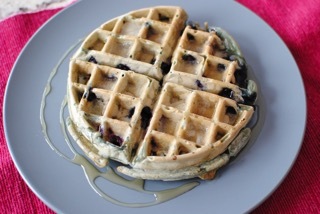 Pour 1 cup of batter into the center of a preheated waffle maker and bake until golden brown, about 4 minutes. Cool leftover waffles, wrap in foil, and refrigerate. Reheat in the oven. We’ve really been getting into granola and yogurt for breakfast lately. Personally, I find that it has more staying power than something like a bagel. 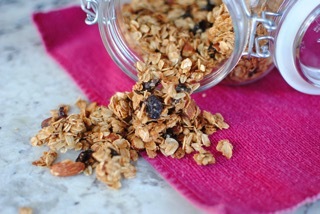 Joel has a favorite granola recipe, which is chock full of nuts and brown sugar, and while it is delicious, I enjoy dried fruit in my granola so I kept on searching. I’ve made countless different recipes, and I have to say that this one ranks up there among my favorites. A little bit nutty and a little bit fruity, the almonds and cherries are the perfect pair. Not only does this granola cook quickly, it stays together perfectly, which creates the most deliciously perfect clusters to top my morning yogurt! It’s the first Secret Recipe Club reveal day of the year! This month, I was assigned to Karen’s Kitchen Stories. 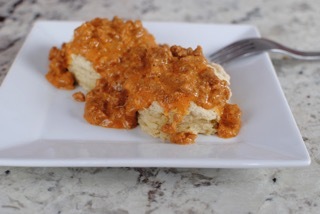 Karen, a busy, working mom and grandma, has so many amazing recipes on her blog with beautiful pictures to go along with each one. I know that I say it every month, but I really, truly had a difficult time paring down what I wanted to make from her blog. While she has posted many delicious main dish, side dish, appetizer, and dessert recipes, her favorite thing to make is bread, which shows through her extensive list of recipes in her bread category. It’s no secret that we are big on carbs in this house, so I wanted to take advantage of all of the bread recipes that Karen had to offer. 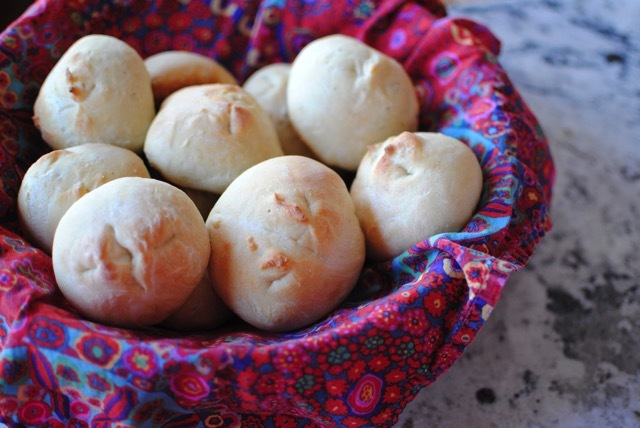 While searching, I came across this Kimmelweck Roll recipe. I’m from Buffalo, NY and Beef on Weck is about as Buffalo as you can get, next to wings, so I knew that this was the bread recipe that I had to make! I’m so glad I did! Of course, we could’t resist trying one hot out of the oven, which was so delicious! The flavor of these rolls are spot on for some of the best I’ve had around my city. They made for the perfect vehicle for a roast beef sandwich! Thanks for giving me a reason to try my hand at a hometown staple, Karen!! In a small bowl, stir together 1/4 cup of the warm water with the yeast and set aside for 5 minutes. Meanwhile, in the bowl of a stand mixer, stir together the remaining 3/4 cup water, oil, sugar, salt, honey/barley syrup, and one egg white. Add 1 1/2 cup of the flour along with the yeast mixture and combine with a wooden spoon. Add another 1 1/2 cup of the flour and mix to combine. Knead the dough with the dough hook for 5-7 minutes. The dough should be smooth, elastic, and tacky but not sticky. Add additional flour if the dough is too sticky. Form the dough into a ball and place it in an oiled bowl, cover with plastic wrap, and let rise for about 1 hour, until doubled. Punch the dough down, cover, and let it rise for 30 more minutes. Divide the dough into eight equal pieces. Roll each piece into a ball and slightly flatten. Place the pieces onto a parchment lined baking sheet, pray with oil and cover with plastic wrap. Allow the dough to rise for 30 more minutes. Meanwhile, preheat the oven to 425 degrees F. In a small bowl, whisk the remaining egg white with 1 tablespoon of water and brush over the rolls. Cut crescent shaped slits into the tops of the rolls and sprinkle them with the salt and caraway seeds. Mist the rolls with water and place them into the oven. Bake for 5 minutes, then quickly mist the rolls again. Continue to bake for an additional 20 minutes, or until browned. Cool on a wire rack before slicing. This year, I didn’t make too many Christmas cookies. I participated in two online cookie swaps, and one cookie exchange with my friends, but aside from the small amount I made for each of those, I didn’t make any cookies. Instead, I decided to try my hand at making homemade marshmallows. I made Alton Brown’s recipe, bagged them up 6 at a time, tied them with ribbon, and gave them to my family at our after-Christmas gathering. They were a hit, especially with the kids! I had a few bags left, so I whipped up a jar of homemade hot cocoa mix and planned to bring my best friend hot chocolate and marshmallows when I brought over my goddaughter’s present. I came home from work one day and noticed that the marshmallows were no longer on the counter. In a cleaning spree, Joel had accidentally thrown them out. Luckily, I had plenty of ingredients to try again, this time trying a different (& flavored!) recipe. Making marshmallows is incredibly easy and the outcome is fabulous. They are perfect for eating plain or topping a mug of hot cocoa. The hardest part is waiting for them to set. To be honest, I don’t buy marshmallows regularly, but now that I have seen how simple it is to make my own, I may not ever go back to buying bagged marshmallows whenever I need them. If dipping the marshmallows in chocolate, melt the chocolate in a double boiler or in the microwave on 30 second intervals. Once melted, stir in the coconut oil. Dip a portion of each marshmallow into the chocolate and place them on a sheet of wax/parchment paper. Sprinkle toasted coconut on top, if desired. Let sit for about 30 minutes to set before serving. Happy 2015! I’m ringing in the new year with a delicious cocktail-inspired dessert! Joel and I discovered Dark and Stormy cocktails on our trip to Newport, RI and haven’t been able to get enough of them since. While the drinks remind me of summer, they really are delicious all year round. We hosted Christmas dinner at our house, and since I chose the meal, Joel chose a dessert from a cookbook we have. I should have guessed that he would pick this cake. Perhaps he was nostalgic for the warm ocean breeze or maybe he just wanted an excuse to have rum in his dessert, but either way, it was the perfect way to end a Christmas meal! In the bowl of a stand mixer fitted with the paddle attachment, mix the sugar, molasses, and oil. In a separate bowl, combine the flour, ginger, cinnamon, cloves, and pepper. Slowly add the flour mixture to the sugar mixture and mix to combine. Add water, rum, eggs, lime zest, and baking soda. Fold in the chocolate. Pour the batter into a 9-inch round cake pan that has been buttered/sprayed with non-stick cooking spray. Bake at 350 degrees for 30 minutes. Cool on a cooling rack, then remove the cake from the pan and let cool completely. Melt the chocolate in a double boiler (or in the microwave in 30 second intervals, stirring between each). In a bowl, cream the butter and vanilla with the powdered sugar. Add the cream cheese and melted chocolate and combine until smooth. Pipe or spread on cake. Depending on how much frosting you like, you will have leftovers. Store in the fridge. New Year’s Eve is finally here. It’s crazy how fast time flies. Joel and I were talking the other day and he mentioned that nothing really happened this year. I’m not so sure I agreed, so In the spirit of the season, I decided to take a moment to reflect upon 2014. This spring, Joel surprised me with a trip to NYC for my birthday, which ended up being a food-lover’s dream! While we ate at many amazing places, it was that weekend when I first tried Shake Shack, and while we aren’t really fast food people, I’m so glad there isn’t one near us because it could be potentially dangerous! We also traveled to Nantucket for the first time this summer. What a beautiful little island. I could go back every summer and never get sick of it! That trip ended in Boston for my cousin’s wedding. What an amazing trip it was! Later in the summer, we visited Philadelphia with friends. That weekend was so memorable for us. We ate one of the most delicious meals of my life at Zahav, we finally saw one of my favorite artists in concert, and our friends got engaged! We attended their wedding in December and it was absolutely beautiful! This past year also brought many babies. All within a few weeks of each other, Joel’s sister and her husband welcomed their second son, Lucas, my best friend and her husband welcomed their first child, and my goddaughter, Charlotte, and my brother and his wife welcomed their third daughter, Magda. This past October, our little family grew too; we got a dog! We had been talking about it for a while, but just assumed that it would only be fair to get one in the summer when I was home from work, so that it could get used to being at our house and learn to be potty trained. We lucked out. On Columbus day, I took a random trip to the SPCA to fill out an application so we were on the list for when the perfect dog showed up. Little did I know that the perfect dog was already in the back waiting for me. I walked back to take a peek and found a 1 year old black lab named Willow curled up in her pen. I spent an hour outside playing with her, put her on hold so that Joel could meet her when he came home from work, and went back about 15 minutes later with Joel to spend another hour outside with her. It broke our hearts to make her spend another night in her pen, but two days later, she was home with us. She was already potty trained and she really is a great dog! All in all, 2014 really was a great year for us, our families, and our friends! I can only hope that 2015 is just as good to all of us, and to you as well! I wish you and your family a happy and healthy new year! While I didn’t post as much as I would have liked to this year, there were most definitely some recipes that stood out in our minds as favorites. So, as I do each year, I’d like to reflect on the food we’ve had throughout the year and share those favorites with you. What were your favorites? January: 15-Minute Wonton Soup. What a delicious and simple recipe. This soup has warmed us up time and time again! February: Peanut Butter Pie. A birthday request from my brother, this pie married his top two birthday flavor requests of peanut butter and Oreo! March: Sriracha Turkey Meatballs. I’ve mentioned that we don’t repeat many recipes around here. This one has been made at least a half dozen times, which should say something about how delicious it is! April: Mediterranean Quinoa Salad. Once I learned how to properly cook it, quinoa has become one of my favorite grains. This salad is as delicious as it is easy to put together. May: Homemade Shake Shack Burgers. After our trip to NYC, Joel had to go find a recipe to make Shake Shack at home. These burgers are delicious, and that sauce is to die for! June: S’mores Scones. A bite sized taste of summer, made for my cousin’s bridal shower. These were a hit! July: No-Knead Cinnamon Buns. A great way to start off any day! August: Crispy Cauliflower Tacos with Mango Salsa. We took a risk with this one and it ended up being one of the most delicious surprises of the year! September: Greek Cucumber Noodles. Zucchini make a great substitute for pasta in this salad. October: Stovetop Applesauce. 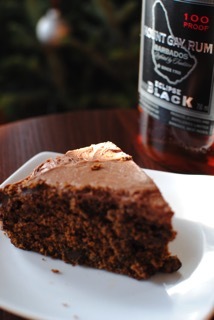 After a day of apple picking, this was a great way to use up our bounty! November: Sour Cream Chocolate Bundt Cake. This was one of the most moist and delicious chocolate cakes I’ve ever eaten. December: Chocolate Pinwheels. I don’t know what part I like more, the swirls or the taste!